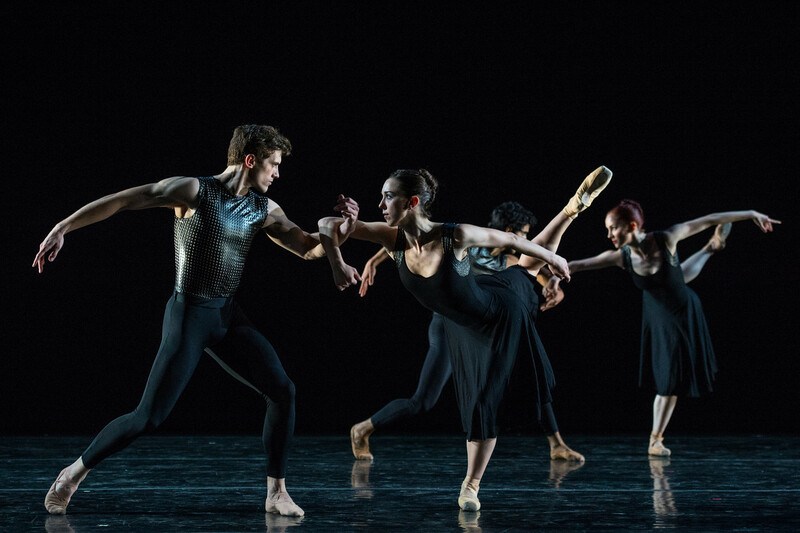 The Caprice of Squirrel & Hummingbirds| Cincinnati Ballet at the Joyce Theater…. 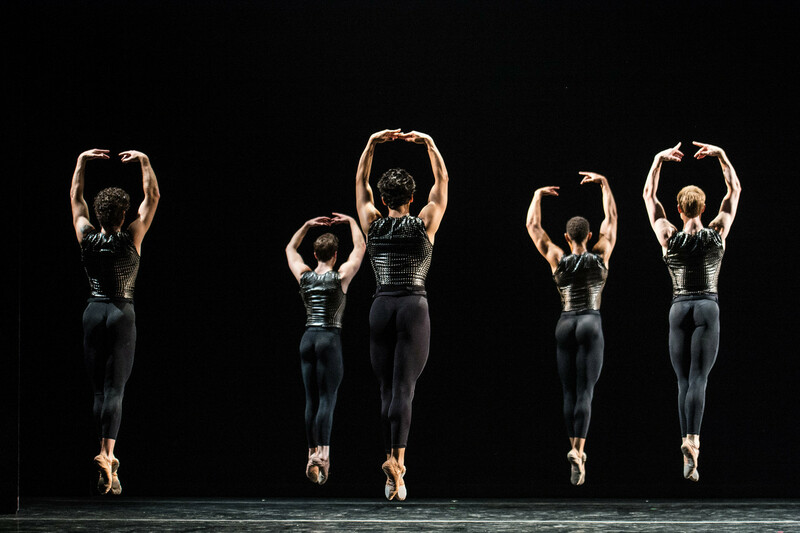 After a 35-year absence, Cincinnati Ballet, led by Artistic Director Victoria Morgan, made its Joyce Theater debut featuring three New York premieres, May 6-11, 2014. The program included Hummingbird in a Box, set to seven new songs by Grammy Award-winning Peter Frampton, Chasing Squirrel, a daring and eccentric work by Trey McIntyre, and Caprice, a new ballet by Val Caniparoli. Now, it must be stated from the onset that the dancers of the Cincinnati Ballet are not good….they are very good, they are strong, polished and flow across the stage like butter on a toasted bagel…….smooth……..
Hummingbird in a Box is a work for eight dancers which feature seven new compositions by Grammy Award-winning Peter Frampton and Grammy Award-winning producer/songwriter Gordon Kennedy. Choreographed by Cincinnati Ballet’s resident choreographer, Adam Hougland, Hummingbird in a Box was given its World Premiere last year in Cincinnati. The piece started with the full cast in The Promenade’s Retreat, the choreography for this section was smooth and lyrical, Mr. Frampton’s score and the movement well married. 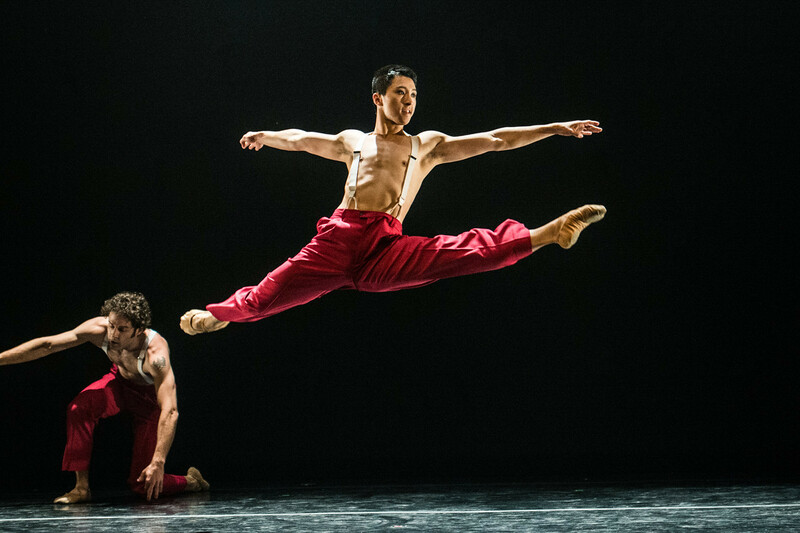 For One for 901, a trio for James Cunningham, Liang Fu and James Gilmer the choreography was more aggressive, the men bare-chested and wearing tight-fitting white jeans. Friendly Fire began with a solo by Patric Palkens who attacked it with challenging leaps and turns. He received enthusiastic applauds when he finished. Val Caniparoli’s Caprice is set to selections from Paganini’s Caprices for Solo Violin. The work is shown in nine sections, for each section a violinist, either Haoli Lin and Yabing Tang, would come on stage and play while the dancers performed. The work is a collection of duets, trios and book-ended by sections that included the full cast. It’s a neo-classical work that employs a contemporary voice reliant on the classical vocabulary. Watching it I was reminded of Balanchine’s Leotard Ballets, plotless, focus is on the sculptural aspects of the body and its transitions from movement to movement. It was a fun work and beautifully danced. When Trey McIntyre’s Chasing Squirrel began I did not know what to think. At first the music, selections from Kronos Quartet’s Nuevo, was so irritating I hated everything about it, but as the work progressed the novelty of both the piece and the music wins you over. Chasing Squirrel is just fun, near naked guys, well one is naked except for a hat strategically placed, are both fascinated and intimated by the women who, from the Mexican inspired music, seem employed in some low rent brothel down south of the border…way south. The women were tantalizingly in all black almost see-through tube tops and low hip-hugging miniskirts, their hair teased out into something resembling a well-cared for rat’s nest. The men first seen only in very white briefs then in red (almost but not really) Zoot suits and throughout the work run on and off the stage in varying states of being dressed and undressed. The women proudly own the night and the stage, the men try for their attention like a peacock pruning, slicking back their hair, straightening their shirts and jackets, each wants to out do the other while not being obvious about it. One man pants another man as he is chatting up one of the girls. The pants man runs off stage in embarrassment. Now, I have several major complaints, first is the fact that it took 35 years for the Cincinnati Ballet to once again perform in NYC. Let’s hope it’s not another 35 years before we see them again. I also hate the fact that Cincinnati is not closer to NYC, if it were I would be front and center every time the company performed. But what really bummed me out is that I did not get to see Cervilio Miguel Amador perform, not once, not one pirouette, one jeté or one hair toss. Mr. Amador only performed four times in one piece, Chasing Squirrel, during the Joyce engagement and not on the night I attended. I was surprised for Mr. Amador is featured prominently in the videos and press photos for the Cincinnati Ballet that I had received. Well, here’s hoping he is well and uninjured and comes back to NYC soon. Cincinnati Ballet is visiting New York City as part of CINCY in NYC, a seven-day showcase of the best of the “Queen of the West’s” performing arts, including Cincinnati College-Conservatory of Music’s (CCM) jazz alumni performing at Lincoln Center, Cincinnati Symphony Orchestra, The Ariel Quartet, and other performing arts related events to be presented around Manhattan. Visit www.cincyinnyc.com for more information. « MADboots ONE NIGHT ONLY | Share Tweet Forward….